Carson Leftwich is the first person you see when you come into the Graduate College. As Office Associate, she works the front desk, among her many roles. She spends quite a bit of time on the phone, answering questions, guiding prospective graduate students through the admissions process, and referring calls to the respective departmental graduate advisors. Carson is an editor and writer who produces the Graduate College’s articles for the “Prism” newsletter and the “Graduate Standard.” She guides two fellowships, the Thurgood Marshall and the Alliance for Graduate Education and the Professoriate (AGEP) through the application and award process. She also handles the calendar of Tony Dennis, Director of Graduate Student Research and Retention, making sure he gets to and from his recruiting events across the country. When he has a schedule conflict she stands in for him at recruiting events. 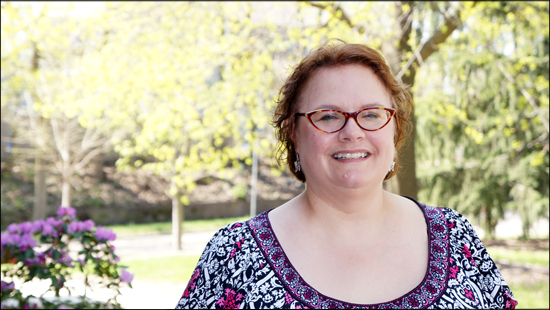 She assists with the Graduate Research and Creative Scholars and Graduate Teaching Effectiveness awards in the Spring and coordinates the AGEP Dissertation Writing Retreat in May. It is difficult to pin her down to one job category as she wears many hats since coming to the Graduate College in June, 2008. Carson has her B.A. in History from Western and an M.A. in History from WMU as well. She taught part-time at Western for 13 years after getting her Master’s. She is currently working on a certificate program in Higher Education and Student Affairs (HESA) in the Department of Educational Leadership, Research and Technology. She and her husband, Kirk, have two grown children and enjoy spending time at Lake Michigan, socializing with friends, antiquing, traveling up north to the Leelanau Peninsula, and attending vintage Volkswagen events.